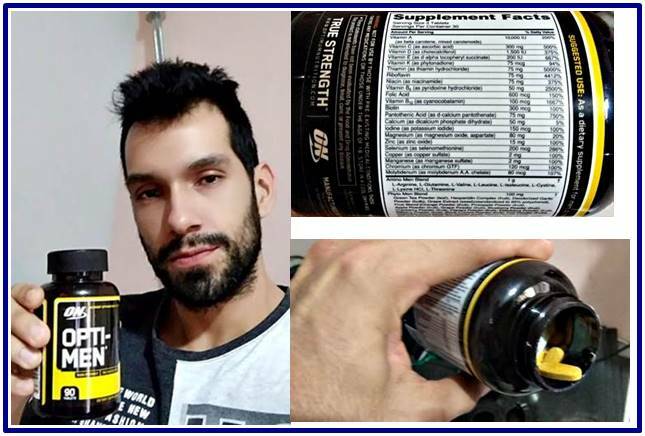 Home nutrition Opti-men optimum nutrition supplements vitamin zinc Opti-men by ON: review, analysis and opinions, how to take it? Opti-men by ON: review, analysis and opinions, how to take it? Review, analysis and opinions of the Opti-men by ON. I want to share my experience taking the multivitamin Opti-men by ON (Optimum Nutrition). I want to mention some aspects to take into account when taking the Opti-men to reduce the waste of all the great amount of micro nutrients (vitamins, minerals and amino acids) and enzymes it provides, and of course to make the most of this very complete multivitamin. Should I take a multivitamin like the Opti-men of ON? Faced with this question and what I mentioned in the previous paragraph, I mean that the fact that the Opti-men is very complete, could also become a kind of double-edged sword for some people, especially for those that can already be given the luxury of consuming a very complete diet, or for those who have some type of problem in their digestive system at the level of the liver, stomach, kidneys or intestines. Why Opti-men is not for everyone? Some people who eat very well simply do not require taking multivitamins because their body is not an infinite store of micro nutrients, although some vitamins like A, D, E and K, can be stored in large quantities in places such as adipose tissue. The other thing is that some people simply eliminate this excess of nutrients through the urine and feces without feeling discomfort, while others may experience some discomfort such as mild diarrhea and change in the color of your stool (usually the yellowish color of Opti-men's tablets) ... some may experience dizziness, nausea. This multivitamin I tried to consume it in days where my food was not the most balanced as well as in days where I could ingest a good amount of micro nutrients mainly through vegetables and some fruits ... it is possible to emphasize besides that I practice sports like Volleyball and football, and also perform weight training at the gym. There was a time when I was sick from the flu and I also consumed the Opti-men, and in this case I felt that it helped me a lot to cope with the discomforts of this annoying virus. But when I got better and started to take a diet rich in vegetables and fruits (in addition to other types of food), I felt that my body did not require it (the Opti-men) ... or as if taking the Opti-men I fell bad and my body would reject it. NOTE: When I was sick I also ate a good amount of fruits and vegetables. Why do I say that the Opti-men started to look bad on me? Because I started to feel some gastrointestinal discomfort like sudden urges to go to the bathroom with annoying cramps, and also the color of the stool was very yellowish and the texture of the same was different (it felt softer than normal) ... well, I hope that saying this does not make you sick and make you stop reading this review. And these discomforts appeared even when I only took one Opti-men paste for each intake, one in the morning, one in the afternoon and one in the evening. There are those who may take the 3 in a single dosis, but for me this would be a waste even for a person who trains hard and that their diet is not rich in fruits and vegetables ... especially at the level of water soluble vitamins that provides, taking into account that these are not stored in the body. Well ... I still continued to consume it for a few more days to see if resuming high intensity workouts, these discomforts disappeared ... because I simply thought they had appeared because my body was receiving more nutrients than I could spend-store. .. NOTE: While I was with the flu, I did not practice sports or weight training. ... But, really, this situation did not improve. In addition, another thing I noticed is that I felt something "heavy", something like contaminated, as with sudden dizziness and as if my digestive system did not want me to continue sending this yellow multivitamin ... despite being so complete (more forward you will see the photos of the nutritional information of the Opti-men, and also I wrote them in case you can not read them in the image). So, I want to say that this happened to me. It does not happen to yourself or someone else. I emphasize that the time my body required a lot of nutrients (the moment I was sick) I felt that the Opti-men helped me to cope with these discomforts, because I did not get as hard as the other times I've been sick from the flu ... chance or psychological suggestion? I do not know. And I reiterate that when I got better and started to eat as well as when I was sick ... (I actually increased the consumption of fruits and vegetables), I felt that I no longer needed this multivitamin. However, I tried a more "soft" multivitamin, in this case talking about the M-brand Z-bec, to see how I felt and good, at least it did not affect me at the gastrointestinal level. I also opted for this multivitamin especially for the Zinc which is so rare in a diet ... NOTE: yes, I know that Opti-men also provides zinc, but the rest of what it brings was excessive for my body. How do I recommend taking Opti-men? I recommend dividing the intake of the 3 recommended tablets / tablets to the back of the jar. One next with the breakfast, one next to the lunch and one next to the dinner. However, if you notice that taking all three pills / tablets gives you gastrointestinal discomfort that you have never experienced before, then lower your intake to only two pills. And if symptoms persist, lower intake to only one pill (maybe next to breakfast). And if definitely the annoying symptoms persist, it is perhaps because your food is already balanced enough in nutrients. Or maybe it's because your body is not spending more than you're giving, so try to start training, or if you do then try increasing the intensity and / or volume of your workouts (although this varies from according to the aesthetic and / or performance results you want to achieve). But if you still do all of the above, and the annoying symptoms continue, so do not consume the Opti-men anymore and maybe try either increasing fruit and vegetable consumption more and / or taking a softer multivitamin, for example one that only supplies vitamins and minerals, and not in addition amino acids, herbs and enzymes as does the Opti-men by ON. Recommended serving size: 3 tablets. Servings Per container (90 Tablet Jar): 30. L-arginine; L-glutamine; L-valine; L-leucine; L-isoleucine; L-cysteine; L-lysine; L-theonine. NOTE: The "L" simply indicates that they are for human consumption. Green tea powder, Hesperidin complex, odorless garlic powder, grape extract, fruit blend (orange powder, pineapple powder, apple powder, grape powder, blueberry powder, cherry powder, papaya powder , black pepper powder, kiwi powder), vegetable mix (wild sweet potato powder, powdered carrot, spinach powder, cauliflower powder, kale powder, brussels sprouts powder, broccoli powder ). Saw palmetto extract, Damiana extract, Panax ginseng extract, Ginkgo biloba powder extract, nettle powder extract, pumpkin extract, raw oyster concentrate. Microcrystalline cellulose, stearic acid, croscarmellose sodium, Pharmaceutical enamel No.2, Magnesium stearate, silica. Well, as you can see, this is a very complete multivitamin ... in fact overly complete you might say. Perhaps for this reason the Opti-men can generate some gastrointestinal discomfort in many people. For this reason, take it only if your diet is very low in fruits and vegetables and if you also perform high intensity workouts (crossfit, powerlifting, traditional weight training, high intensity sports, etc.) ... otherwise it could be a great waste of money, even if it did not cause you any inconvenience.